While most think of Miami Beach in terms of its bronzed beautiful people, award-winning restaurants, ultra-chic energetic SOBE nightlife and opulent hotels, this tourist mecca is full of surprises. Having become a destination of choice for even the most discerning amongst us, it is home to two renowned orchestras, a world-famous ballet company, and a number of prestigious museums and galleries. It also plays host to some of the world’s biggest art and cultural events, such as Miami Art Week and the literary acclaimed Miami Book Fair International. 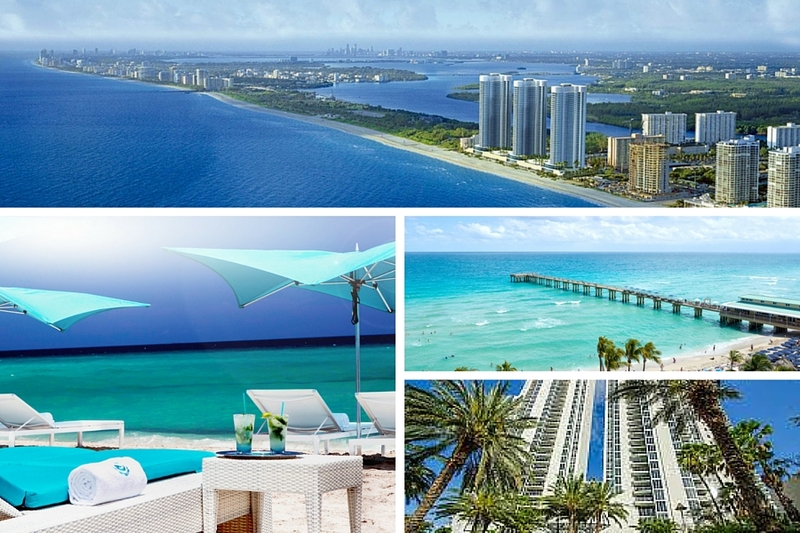 A world-renowned winter playground, Miami Beach has it all. A destination that has transformed itself over the last 100 years into a sophisticated metropolis, it seamlessly offers all the amenities of a beach-town and diversity of a cosmopolitan city. With an amalgamation of cultures giving the city a unique personality, it is undoubtedly its Cuban and Hispanic influences that have had the most impact. From super strong Coffee Con Leche to mouth-watering fusion cuisine, hand rolled cigars and captivating musical styles, these vibrant communities have certainly left an indelible mark. Whether you want to step back in time and admire Art Deco architecture on Ocean Drive, get inspired by the Design District, experience a taste of Cuba in Little Havana, get your high-end retail fix in Bal Harbour or sail the waves along the coastline, Miami certainly has a little something for everyone and Concierge Services Miami is here to help. A picturesque respite nestled beside the Atlantic Ocean coast, Bal Harbour is no doubt one of Florida’s most fashionable destinations. Located only fifteen minutes north of South Beach’s energetic whirlwind of activity, this quaint one-square-mile village is a favored hideaway of the rich and famous. One of the most affluent zip codes in the US, it truly personifies the concept of luxury living. With premium access to Miami Beach, Bal Harbour’s enclave of luxurious oceanfront condominiums, five-star resorts and spas and elegant homes tucked away on the bay behind gated communities ensure it stands as one of the finest neighbourhoods in Miami in terms of sheer value and luxury. And the future of Bal Harbour looks even brighter. Soon to launch, the Fendi Chateau residences see the first foray by the brand into real estate, while the iconic Surf Club expansion by Pritzker Prize-winning architect Richard Meier sees a new home for the Four Seasons Hotel &Residences. Not to be outdone, the spectacular Oceana Residences offer 360-degree panorama of carefree glamor. Beautiful real estate aside, its picturesque bays, ultra-exclusive boutiques, high-end gastronomical dining, gently swaying palm trees, sparkling blue water and surrounding green islands, Bal Harbour typifies tropical, sophisticated living at its finest. A centerpiece of perfectly manicured shopping paradise, Bal Harbour’s shops have made it synonymous with chic designer style and a favourite with fashionistas from across the globe. Despite being often compared to other great fashion destinations, like New York’s Fifth Avenue, Paris’ Champs Elysee and Beverly Hills’ Rodeo Drive, make no mistake with its Modern architectural style and tropical outdoor atmosphere, it’s a true slice of Miami. With catwalks, shaded breezeways, landscaped palm trees, koi ponds and bright tropical flowers, limestone and marble fountains, it’s the elevated experience of intimate shopping that really defines Bal Harbour Shops. To claim it’s home to some of the world’s most famous high-end designer names would not be an idle boast. With names ranging from Chanel, Prada, Gucci, Balenciaga, Oscar de la Renta, Valentino, Jimmy Choo, Giuseppe Zanotti, Harry Winston, Bulgari, Chopard, Tiffany &Co, Van Cleef & Arpels, Hublot, IWC and Piaget, it’s commitment to exclusivity is unquestionable. 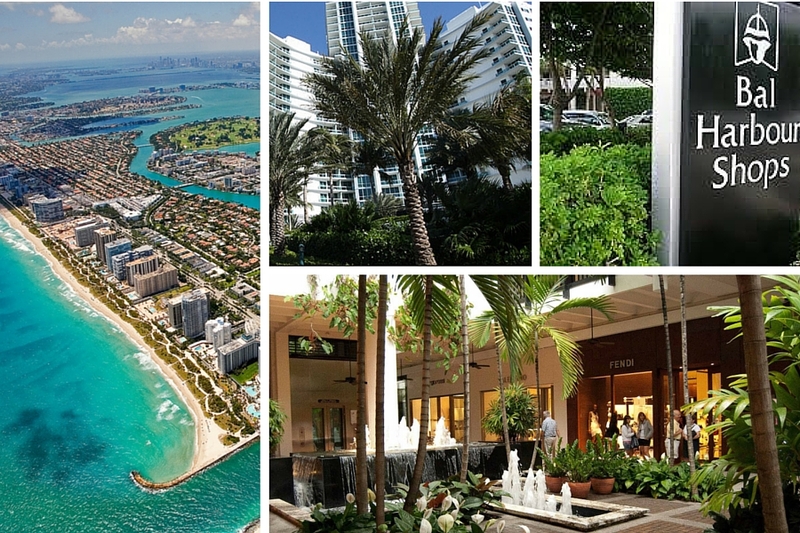 But Bal Harbour is more than shopping. 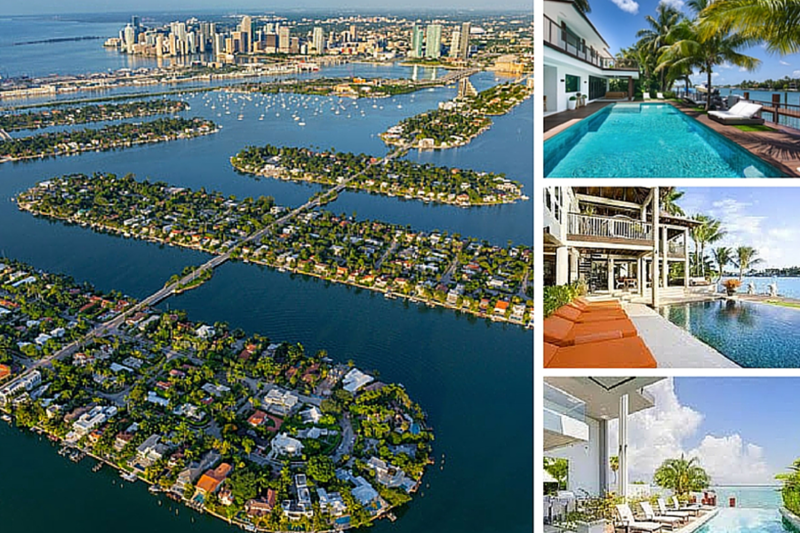 Its marina offers direct access to the waterways of southern Florida and Miami Beach. Then, there’s the fine dining. Just as with everything else in this upscale neighbourhood, Bal Harbour offers the best culinary experience around, with a variety of cuisine that spans the world. You won’t find a lot of “watering holes” or casual dining options. Much like its shopping, it’s all about sophistication. A more casual experience, however, is never more than fifteen minutes away in Midtown or Downtown Miami. So, if stretching out on a chartered yacht as it skims across the water, deep-sea fishing in the Gulf Stream, sinking a birdie on one of Bal Harbour’s beautiful golf courses or just relaxing on a sultry sun-soaked beach is your idea of paradise, this is the place for you. 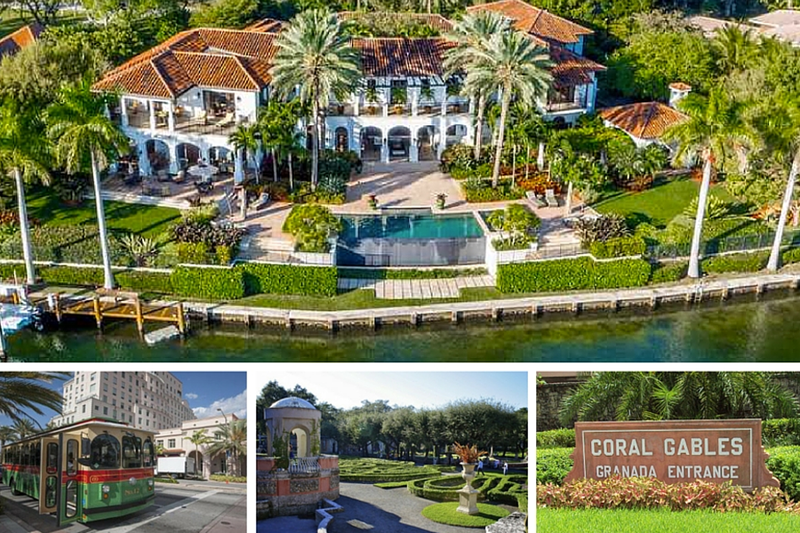 Located to the south of Miami proper in Miami-Dade county, Coral Gables is one of the oldest and most prestigious neighborhoods in the greater Miami area. With banyan tree-lined boulevards, that open into beautifully carved plazas, complemented by beautiful old-fashioned Mediterranean villas and homes, Coral Gables, certainly lives up to its other name “The City Beautiful”. As one of the most historic and classic residential cities in South Florida, it encourages the mind to drift to an easier, simpler time in history, when life was a little slower, and simple pleasures could be enjoyed more fully. The vintage style circulator trolley system that runs down Ponce de León Boulevard is a good case in point. Home to the University of Miami, Coral Gables was developed by George Edgar Merrick in the early 1920s. As one of Miami’s earliest planned communities, its picturesque appeal is reflected by such landmarks as the Venetian Pool, the Biltmore Hotel, Vizcaya and the Fairchild Tropical Botanic Gardens, it’s tranquil ambience is pretty much as good as it gets. With Miracle Mile known for its shopping with a European flair, restaurants and upscale boutiques, Coral Gables is dedicated to serving up only the best in fine living and elegance. Adjoining Coral Gables, to the east and slightly to the south, is the neighborhood of Coconut Grove. Officially the oldest inhabited neighborhood that is recognized as being a part of the city of Miami proper. It is host to a renowned annual art festival, as well as a regular farmer’s market, the Coconut Grove Playhouse, and a local sailing club. With both the City of Coral Gables and the neighborhood of Coconut Grove offering the promise of privacy, combined with peace and quiet, luxury rental properties, such as villas, apartments and condos, are certainly available. 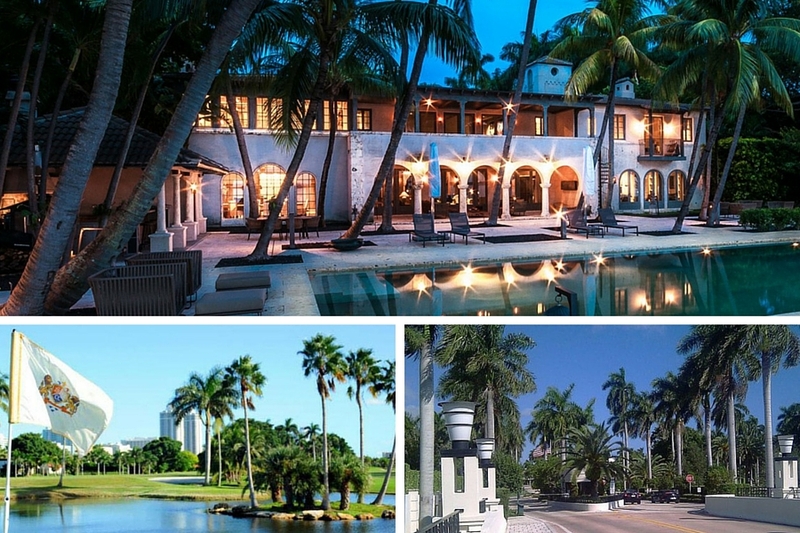 However, the areas are best known for their gated communities, such as Deering Bay, palatial estates, old-world sprawling houses and opulent townhouses valued at tens of millions of dollars. For the best that metropolitan living has to offer, one need look no further than Downtown Miami. Part international financial hub, part cultural center its unique blend of innovative skyscrapers, tourist attractions and retail stores, reminiscent of Miami’s humble beginnings as a trading town make it the perfect work meets play location.With a little something for everyone’s taste, Downtown Miami is a diverse entertainment mecca. 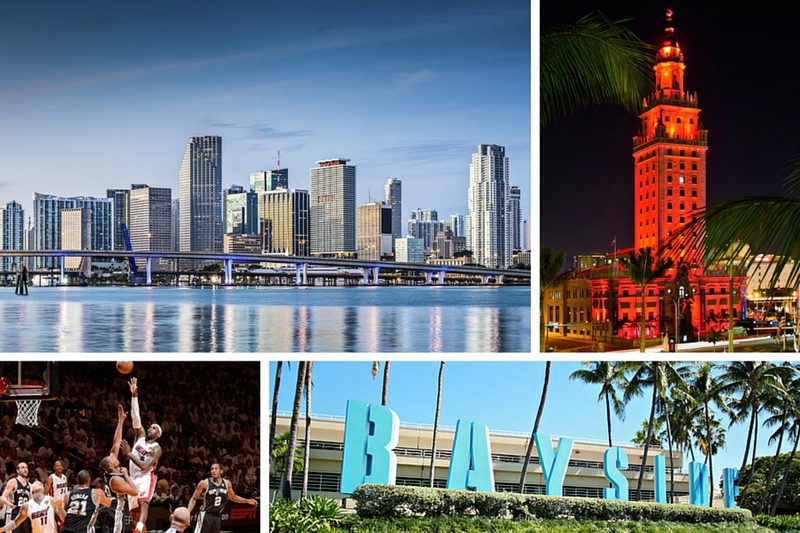 Attracting global superstars from Madonna to Lady Gaga, The Eagles and Beyoncé, the American Airlines arena is not only a magnet for music fans but sports lovers alike, being home to the Miami Heat NBA team. Right next door Bayside Marketplace and Bayfront Park provide a scenic destination for casual shopping, plus a place to relax and take in the view. Traditional artistic forms are also highly valued in Miami, along with more modern influences and Downtown is one of the places that brings everything together under a unified aesthetic that speaks to a sense of class and style. If ballet, opera or theatre is your thing, the world renowned Adrienne Arsht Center is sure to delight. More of an art aficionado, then Museum Park is the perfect place for you. Housing the Perez Art Museum Miami (PAMM), it’s ever-growing collection of international modern and contemporary art of the 20th and 21st centuries provides a unique splash of rich culture to celebrate the strong, supported art scene that Miami has to offer. With the Patricia and Phillip Frost Museum of Science currently under construction and an Aquarium and Planetarium soon to follow, there’s even more reason to explore this ever-evolving neighbourhood. Perfect for the business traveller, it’s unique blend of commercial, residential and visitor attractions ensure that Downtown Miami keeps you busy by day and entertained by night. While not a part of the trio of islands that is Star, Palm and Hibiscus, Fisher Island, located south and east of Star Island on the opposite side of Dodge Island, merits its own particular mention. Set against breathtaking views of the iconic Miami skyline, Fisher Island is located on Biscayne Bay and the Atlantic Ocean and is one of Miami Beach’s premier, residential communities. 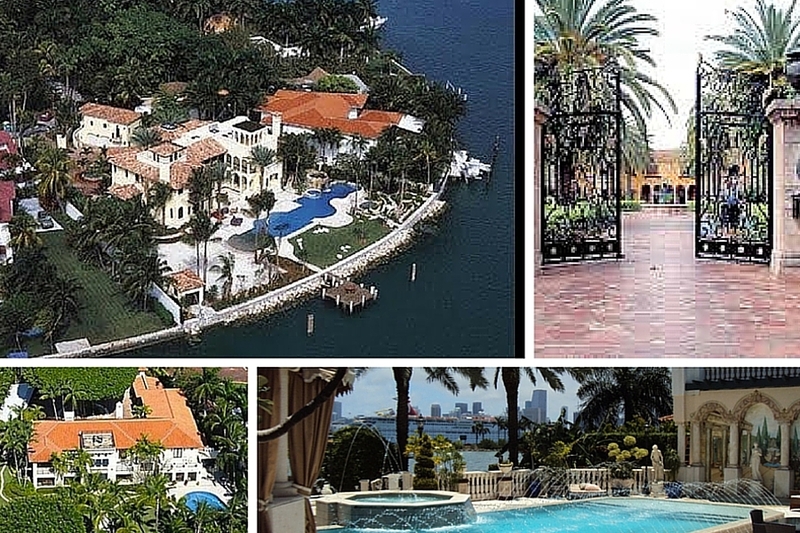 The former winter estate of William K. Vanderbilt, it has one of the best beaches in Miami. Only accessible by car, ferry (which runs 24/7), private boat or helicopter, this beautiful island offers a captivating array of luxury homes. Ranging from Mediterranean style villas that showcase spectacular vistas, spacious, light-filled condominiums with panoramic views, to large magnificent luxurious family homes on the Island’s private golf course. 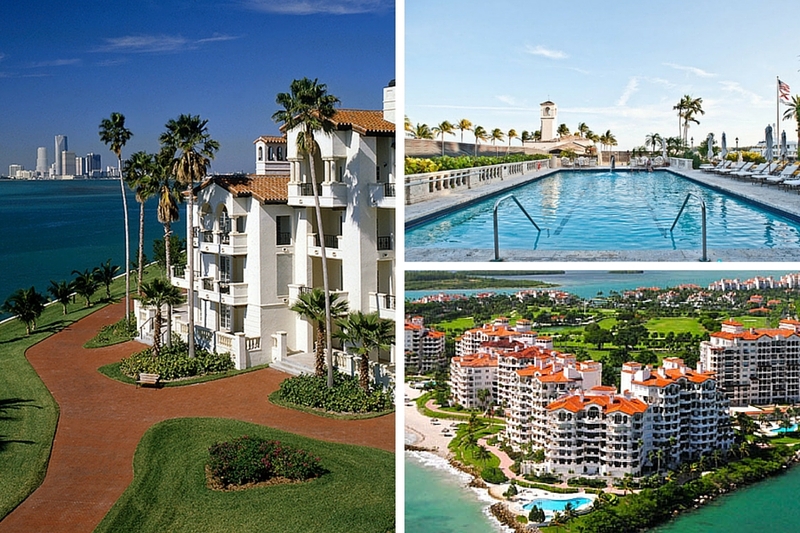 With a little something for everyone, Fisher Island is pretty much self-contained, having the convenience of a private school, bank, post office and fire station, not to mention assorted shops, tennis courts, a golf course, a polo field, a luscious private park, and stunning marina and yacht club. Having been home to Boris Becker, Bono, Oprah Winfrey and many more A-listers, this secluded 216 acre Island hideaway is a lifestyle retreat. The perfect island hideaway, La Gorce Island is an exclusive gated community found within a part of the greater Miami Beach area known as North Miami Beach. Located within the picturesque Biscayne Bay, “La Gorce” also includes the neighboring Allison Island. Comprising of some of the more beautiful and exclusive rental properties in Miami Beach, these two islands are excellent for those who are looking for a comfortable and luxurious destination away from the cares of everyday life. Home to some of Miami’s most breathtaking estates, La Gorce features a variety of Mediterranean mansions, architectural modern gems and homes with strong Art Deco influences. Blending old world elements with those of the new, to create a unique and diverse environment, La Gorce never fails to be visually stunning. Along the west coast of La Gorce Island, North Bay Road provides picturesque living space where one can expect to rub shoulders with more than just the odd celebrity. Current and past owners of North Bay Road properties include such individuals as Calvin Klein, Matt Damon, Madonna, Lenny Kravitz, Anna Kournikova, Cher, Alex Rodriguez and Jennifer Lopez. Yet another beautiful Miami neighborhood close to La Gorce is Pinetree Drive. With a central location that stretches from 23rd to 63rd Street, it runs parallel with the Intracoastal Waterway and offers many waterfront homes in secluded locations. Not only is it a scenic tree-lined drive, it offers a quiet alternative to bustling Collins Avenue and quick access to South Beach, Bal Harbor and the surrounding areas. 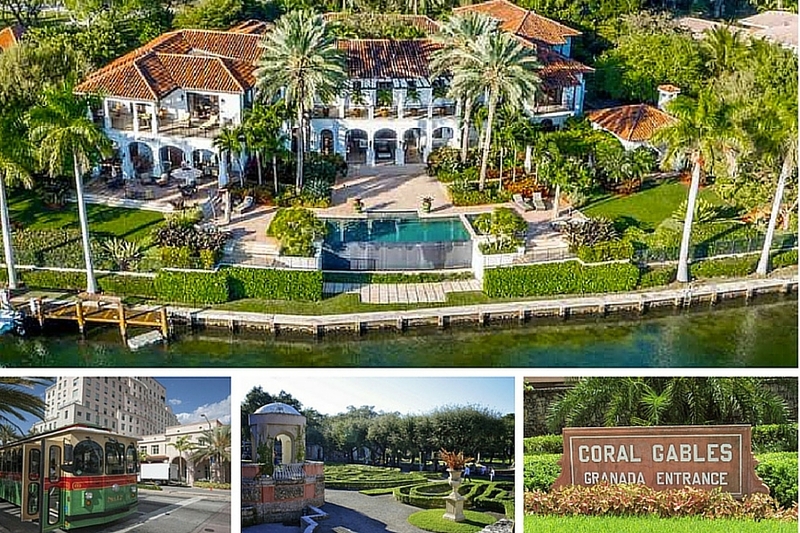 Hugely popular with our clients, all of these prestigious areas are known for their exceptional real estate. It’s not unusual to find luxury homes and villas in these neighbourhoods in excess of 10,000 square feet and amenities like tennis courts, swimming pools, sundecks, boat docks, basketball courts and lush gardens. 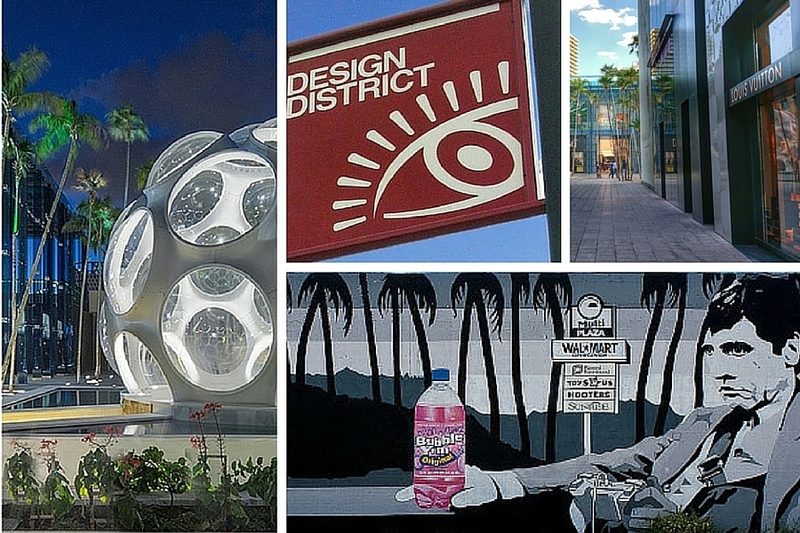 Midtown Miami is reminiscent of a burgeoning SOHO / New York style neighborhood. Part urban infrastructure, part cozy small-town attitude, complete with artisanal bakeries, gourmet cafes, and yoga studios, it has quickly become the new place to be for bohemian South Beach expats. 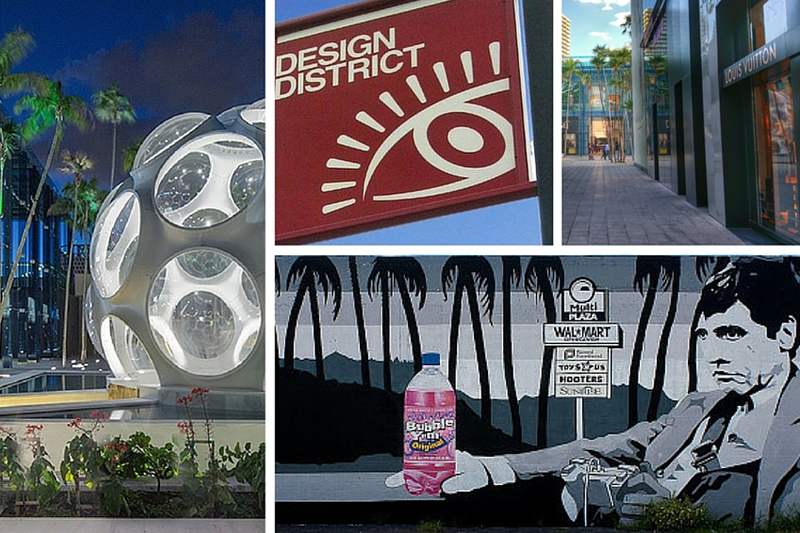 Considered a hotbed for interior designers, gallerists, fashionistas, architects, and artists, it’s located just north of Downtown Miami, south of the world-famous Miami Design District and adjacent to the world-famous Wynwood Art District. A major player in Miami’s ever-evolving nightlife, its bars, lounges, clubs, and restaurants are diverse. Ranging from ultra chic gastronomic delights (such as Michael’s Genuine Food and Drink) to retro after hours speakeasies, Midtown is leading the way in the culinary stakes. Not to be outdone by South Beach or Bal Harbor, it is quickly gaining a name for itself as one of Miami’s top luxury shopping destinations. With designer labels, haute couture fashion and high-end boutiques like Valentino, Fendi, Tom Ford, Dolce &Gabbana, Harry Winston, Givenchy, Giorgio Armani and Van Cleef &Arpel calling Midtown home, it’s fair to say the neighborhood is a personal shopping paradise by day and vibrant, social hub by evening. Just west of Star Island are the equally peaceful islands of Hibiscus Island and Palm Island. These two small exclusive Miami neighborhoods comprised of waterfront homes and luxury estates are only accessible via the MacArthur Causeway or by water. While offering private island living on the beautiful Biscayne Bay, you are just a short drive from the Port of Miami, Miami Downtown and all the excitement and amenities that Miami Beach and South Beach has to offer. While today they are considered the epitome in luxurious family hideaways, half a century ago these locations had an altogether different feel. A mid-century Miami entertainment mecca that drew the likes of Frank Sinatra, Dean Martin, Jerry Lewis and Tony Bennett, it was also home to the Famous Latin Quarter Nightclub… and the infamous Al Capone. 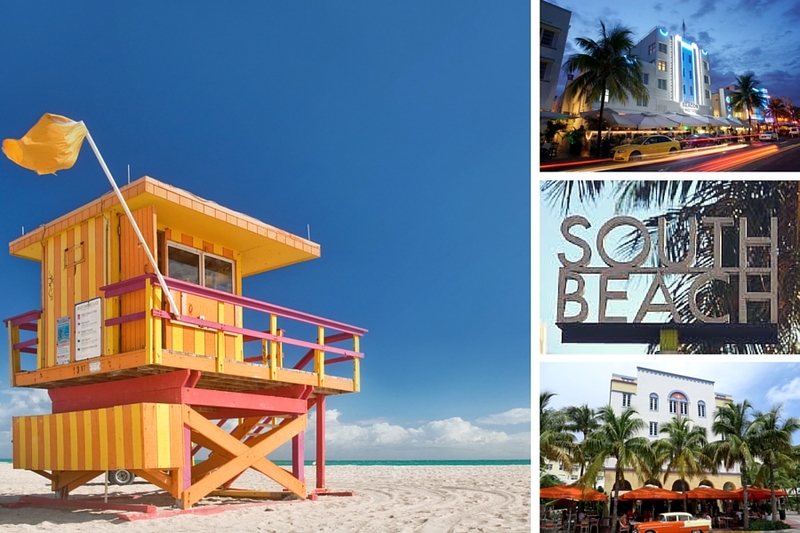 One of Miami’s most desirable neighbourhoods, South Beach has been called the American Riviera. A world famous destination, immortalized by movies and TV shows, South Beach might be comparatively small, but its raw aesthetic beauty has made it Miami’s scene-stealing sultry star. Part of that allure is no doubt due to its sandy beaches, Art Deco architecture, world class boutiques, magnificent dining, hip clubs, a thriving art scene and cultural attractions which draw travelers from around the globe. With tanned skateboarders passing by supermodels in the middle of Vogue photoshoots on the sun-drenched terraces of one of it’s world class hotels, it’s where the true Miami stereotype comes alive. With postcard perfect looks and a distinctive visual style, it’s no doubt one of the nation’s most enticing cities. While a lot of the action centers around Ocean Drive, Lincoln Road, Collins Avenue and the historic Espanola Way, South Beach is also home to many highly acclaimed events, such as Art Basel, the Food and Wine Festival and the International Boat Show. As much a cultural hub as a party destination, South Beach’s ever-expanding mosaic of Miami arts and culture offers a plethora of visual stimulation, personal expression and intellectual exploration. Lovers of the arts are guaranteed to be delighted by the New World Symphony, architectural fans will adore the eclectic Art Deco District, while the Bass Museum is a stunning education in contemporary art. South Beach’s vibrant bar and club scene are more than legendary, with mixology masters capable of mixing any drink a person could want. Ultra exclusive nightclubs and lounges, like Mansion, Story, LIV and Wall Lounge at the W are celebrity magnets with everyone from David Guetta, Afrojack and Calvin Harris having spun the decks. With Jean-Georges Vongerichten’s Market at The Edition, James Beard Award Winning Chef José André at the Bazaar or Michelin starred culinary darling Michelle Bernstein at Seagrape gastronomes are guaranteed to have their palates tantalised… and let’s not forget one of South Beach’s oldest restaurants, the legendary Joe’s Stone Crab which opened in 1913. Sitting on the southern-most tip of South Beach is one of the Miami’s best kept secrets, South of Fifth, also called SoFi. This small, affluent residential neighborhood is within immediate reach of all that South Beach has to offer, but also removed enough to provide the seclusion of exquisite living in some of Miami’s most distinctive condos and lofts. Surrounded by water on three sides, this peninsula features a host of luxury condos (such as Continuum, Murano Grande and Apogee), whose magnificent penthouses have adorned the pages of many an interior design magazine. Facing the crystal-clear Atlantic waters and blue-green reflections of Biscayne Bay, South of Fifth is the very definition of Miami sky high living. For lovers of the ocean waves, the South Beach Marina and Miami Beach Marina is where you’ll set sail on your private yacht charter. Alternatively another perfect escape is the beautiful South Pointe Park. Upscale and highly desirable all of these properties are positioned to provide resort-level access to local amenities varied enough to never lose their unique charm. 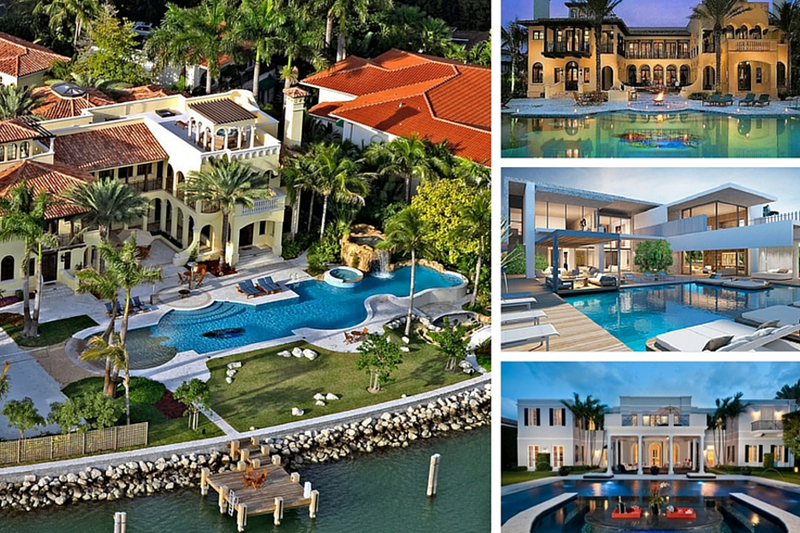 Unparalleled luxury has made homes on Star Island some of the most sought over in Miami. Sitting like a jewel in the beautiful waters of Biscayne Bay, between the Miami mainland and Miami Beach, Star Island lives up to its name. Home to some of the most premier properties of the greater Miami Beach region, past and current residents include Shaquille O’Neal, Rosie O’Donnell, Will Smith and Gloria Estefan. With an average listing price of forty million dollars for a Star Island property, “exclusive” doesn’t quite seem to do the prestigious little island justice. Guaranteeing the highest standards of privacy, yet only minutes away from South Beach and Bal Harbor, Star Island is the “flagship” property of a trio of islands which fall between La Gorce and the Miami mainland. By way of the MacArthur Causeway, these three islands —Star, Palm, and Hibiscus— offer premier access to just about anywhere in Southern Florida that’s worth visiting. A stunning combination of tropical charm meets Miami exclusivity, Sunny Isles Beach is a beautiful barrier island hidden between the Atlantic Ocean and the Intracoastal Waterway. North of Miami Beach and just south of Fort Lauderdale, it’s sleek, palm-lined boulevards serve as home to the luxurious Trump International Beach Resort. With its luxury waterfront condominiums and beach resorts, crystal-clear, turquoise waters, spectacular scenery, and most noticeably miles of gorgeous, white sandy beaches, Sunny Isles is an ideal hideaway. While far enough away from the crowded, faster-paced areas of central Miami Beach it’s still close enough to be a short car ride away from all the main attractions of greater Miami. Assuming a lack of traffic, one can reach South Beach or Bal Harbour from Sunny Isles in about half an hour. While its once funky 50s motels and small beachfront hotels have now given way to premium high-rise apartments and condos, the atmosphere in Sunny Isles still remains uncrowded, understated and casual. You can still drop a fishing line and fish at Pier Park, charter a boat at Haulover Beach Park and sail the open ocean, or just lose yourself watching the waves lap at the shore. Just South of Sunny Isles is the gated community of Biscayne Point. Here, as with Sunny Isles, it’s quaint off the beaten path feel provides a more relaxed speed of Miami living, while still taking advantage of the gorgeous weather, beautiful views, and direct access to the bay itself. In short, these neighborhoods are perfect vacation homes for those looking to take it easy for a while. Just minutes away from the best that Miami have to offer, the Venetian Islands are 6 man-made islands that form a chain between Miami Beach and Midtown Miami. Made up of Biscayne, San Marco, Di Lido, San Marino, Belle Isle and Rivo Alto, the islands offer an eclectic array of different architectural styles, ranging from the traditional to the ultra modern. The winter home of choice for many notable socialites and actors, the area has become one of the most desirable neighborhoods in Miami Beach. This is not only attributed to its incredible luxury villas with waterfront views, but also its close proximity to South Beach’s vibrant social scene and Lincoln Road shopping mall with its myriad of fabulous restaurants, colorful boutiques, art galleries, lounges, and cafés. 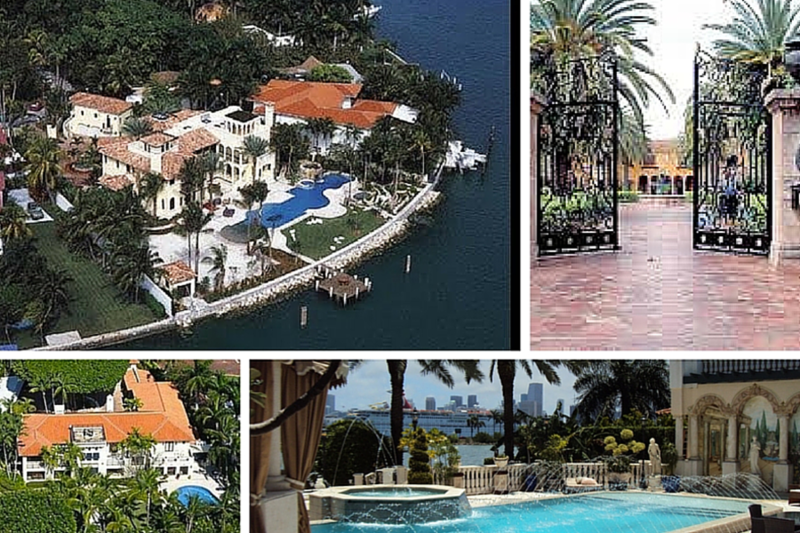 Gaining their name due to the similarity of many of the isles to Venice, the islands have become synonymous with the words exclusivity and high-end opulence in South Florida. With stunning homes offering panoramic scenery to rival that of the Eiffel Tower, the many sprawling waterfront estates provide a sumptuous hideaway to unwind and relax in. So, if you’re looking to stay near the beach, but still want the comfort, privacy, and privilege of living on an island, this is the place for you. To learn more about our luxury villa and condo rental available in these neighborhoods, call us direct on +1-305-798-3302 or get in touch by email.